The Better to Control Your Mind, My Dear. I taught one of my largest training classes ever last week, at the offices of a largish telephone company in Alabama. The class was planned for 12 students, and 17 arrived! 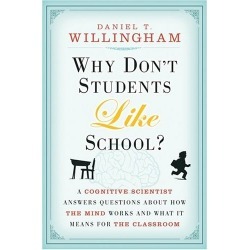 I got to skim-read a new book on cognitive research for teachers, called “Why don’t students like school?” by Daniel T. Willingham. It was fun to apply new techniques to better manipulate my students brains. These are some reflections on my most recent training experience. My wife, Hayden, suggested using the video feature on my phone to record each student introducing himself. It worked well, and watching the video a few times helped me to know everybody. That helps me feel more connected, if nothing else. 1. Force the students to consider their level of commitment. One reason the class went well was that the students worked hard and focused on the class. This isn’t always the case. The students in my class are often key to the operation of their ISPs and telephone companies. The students often struggle to keep up with work while learning new material. There’s a drawback to splitting your attention like this: you stink at both, but you stink the worst at the task that requires the most original thought. This class will require your full attention and concentration to be effective. If you are distracted by other ongoing projects, emails, etc., then you will be frustrated and may not learn much. [ ] I will be completely focused on this class, and will ignore all distractions. I will delay most work requests until after the class finishes each day, or until next week. [ ] I will be periodically emailing, texting or instant-messaging, but mostly I’ll be focusing on this class. [ ] I will be in and out; I have some ongoing projects that will require my attention and that cannot be delayed. I may need to leave the class at times. [ ] I have a lot going on right now. No promises! Perhaps it was just coincidence, but I had an unusually high proportion of my students’ attention. I suspect that forcing the students to consider the options and make a commitment affected their behavior for the week. 2. Use an iPad, and be liberated from the whiteboard. Many classrooms have no whiteboard. In some cases, the whiteboard is covered by the projector screen. But I need both a drawing surface and the projector screen to show my slides and other demonstration. So the projector was attached to my laptop computer. I found an app for iPad called “Air Sketch”. I draw on the iPad, then view the live drawing in a Firefox or Safari browser window on my laptop. Of course, to show the drawing to the students, I just put the browser window on the projected screen. This made it easy to have a whiteboard-like drawing for the room. I could also draw from the back of the room to verify how readable it was from the students’ position. I now prefer Air Sketch with a stylus over a real whiteboard. 3. Test early; test often. During my training, news came out about the value of taking a test when you’re trying to learn something. So I quickly wrote some additional quizzes using Google Docs “forms” feature, and made the students take those tests with a time limit. They say that taking a test helps you to remember the material. 4. Grade often and record the score. I’ve learned long ago to grade the students’ work during the course. I provide live feedback, so they can go fix the parts they did wrong. And it sends the message that I genuinely expect each student to do all the assigned work. And it gives me a chance to interact directly with each student. If I didn’t grade their work, I’d never have a chance to talk one-on-one with some students. I used Docs To Go on my iPad to grade student material. Students do the exercises on paper in their book, so I walk around the room to look at each book. Docs To Go has a passable spreadsheet feature that I used to record grades. It’s a lot of work, but the payout in increased student effort is big. 5. Give substantial rewards for hard work and performance. Throughout the class I gave an award each day for the hardest-working student. This is because progress depends heavily on intelligence, background, AND level of effort. A student in my class cannot change his intelligence or his background knowledge, but he CAN work hard. So I look for the students who are working the hardest. That often means that he’s struggling but he’s also continuing to work until he gets the right answers. This time, I had some little $9 metal keychain flashlights. I gave one or two as an award each day. My point is that the prize each day was really worth having. I’ve tried using candy bars, and it just doesn’t seem to work. Everybody wants to claim to be on a diet. In addition, I gave a Starbucks coffee mug and a Starbucks gift card at the end of the class to the person with the highest overall score. 6. Declare and keep to the daily schedule. I like to specify the daily schedule in advance. I do 75-minute chunks of work and lecture, with 15 minute breaks. Lunch is also 75 minutes, and I do a shorter period after lunch because everyone is sleepy anyway. But the hard thing for me us sticking with this schedule. I’m not a very punctual person normally. However, it helps a lot to get people back in the classroom if they know I’m really going to start after an exact 15 minute break. 7. Maximize student thinking on the Right material. Students remember what they spend time thinking about; as Daniel Willingham put it, “Memory is the residue of thinking.” So I put some effort into ensuring that students really spent time thinking about the right things. This led me to drop a few elements of the class. For example, I usually have students manually configure a SIP IP Phone to register with their VoIP system. But the students spend a lot of time fussing over the silly menus on the phone when they should be focused on the four key elements of SIP registration. The menus on the phone are good to understand, but they don’t need me there to do that. So I reworked the exercise so that they spend time studying a packet capture of SIP registration. I also learned that people are especially good at remembering stories. I wanted my students to remember the SIP call-setup process in a realistic environment. So after studying the process for a few hours, I had them write a short story where the plot is the SIP call control in a realistic carrier environment. I hope they forced the students to really ponder the SIP INVITE transaction, B2BUA’s, and redirect servers. And hopefully remembering their plot will help them troubleshoot failing phone calls.